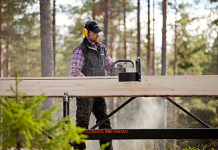 Ove Benjaminsson was one of the first to understand the possibilities of the Logosol Sawmill. 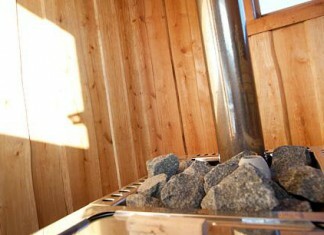 He discovered it on the Swedish forestry exhibition Elmia in 1989. Two years later he bought his own sawmill at the same exhibition. 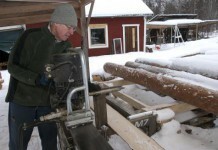 The Logosol Sawmill is still in service. Today, Ove is retired. Back then, he was a forestry entrepreneur with his own forest estate in south-western Sweden. Elmia hired him to book exhibitors. He had no experience at all when it came to selling stand space, but he knew about forestry. “I received a bundle of newspapers and started phoning advertisers,” Ove remembers. He especially fell for one ad, a small one from the then newly established company Logosol. The small ad was enough to make him understand the possibilities of the sawmill. The result of this was that in 1989 Logosol participated for the first time in a large forestry exhibition. ”The Logosol Sawmill was a success. No other product aroused so much interest,” Ove remembers. 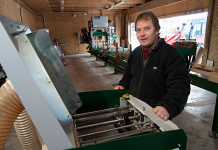 When Logosol two years later exhibited its sawmill at Elmia, Ove bought the demo sawmill. It was later supplemented with a 2.5 metre extension and one of the very first electric saw units, Logosol E5000. 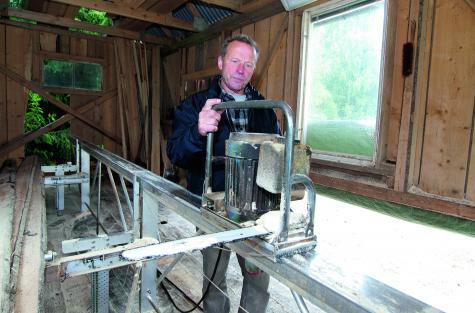 “I have sawn incredibly much timber over the years,” says Ove, who still uses the 20-year-old sawmill frequently. Over the years, he has renovated dwelling house and outbuildings on his farm, and he has also replaced house facades for the neighbours. Buying timber is out of the question, all is taken from his own woods. ” I have poor soil, you see” says Ove and gives us a cunning smile. By that he means that the soil is so meagre that the trees grow slowly. Really slowly. He points at the ends of a couple of planks. The annual rings are so close that they cannot be distinguished without a magnifying glass. The quality is on par with dense larch from Sibiria, but here we are dealing with spruce and pine. After retirement, Ove has become engaged in church affaires and made responsible for a number of buildings that belong to the Church, among them four church houses. When being renovated, the old buildings require first-class timber with the right surface. 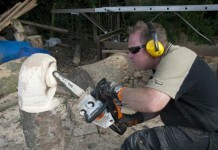 With the Logosol Sawmill the surface becomes like the one old-time frame saws produced, and the accuracy is the best possible,” so once more Ove is the one sawing the building material. He brings Fresh Cut on a tour and shows the tower of the church. The top of the church tower has been renovated. The timber used is delivered by Ove. 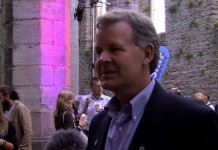 ”I give a 100-year warranty on it,” says Ove. The customer might call for his warranty from the other side, but Ove does not worry about that. 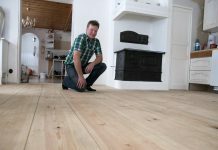 The quality is first-class, thanks to poor soil and a well used Logosol Sawmill.